Details Burnt sienna is an iron oxide earth pigment that resembles red ocher. Unlike ochers, which generally are opaque, sienna earths are more translucent and warmer. When sienna earth is calcined (roasted) at high temperatures, it loses its water content (hydration) and it becomes burnt sienna. The pigment now identified as burnt sienna is a calcined yellow iron oxide earth pigment generally warmer and more transparent than other yellow earths. In the scientific study of historical pigments, it is not generally possible to distinguish yellow earths and siennas. Even in the case of modern pigments, there is often not a clear dividing line between yellow earth and raw sienna. The pigment sienna owes its name to the Italian city, Siena, located in the Tuscany region. An area of rolling hills, it is famous for the mining and production of the pigment since the Renaissance. The localities where sienna earth is found are not confined to the original ones near the town of Siena, but all through Tuscany, Sicily, Sardinia and in the Hartz Mountains of Germany, earth of similar quality is found. In the United States in Pennsylvania deposits of sienna earths are found, and in the mountain ranges of Virginia good, rich deposits have been developed. In the European part of Russia the most widely known sources of sienna earths are in the Kudinovskoye deposit in the Moscow region and the Ukholovskoye deposit of Ryazansk province. Sienna earths have been used as a pigment since prehistoric times, although the name terra di Siena for yellow earth did not appear in painting treatises until the second half of the 18th century. Iron oxide earth pigments, as they often are called, are an important group of inorganic pigments derived from minerals. Iron oxide pigments are yellow, red, and brown, but artists know them as ocher, sienna, red oxide and umber. Unlike manufactured pigments, the color of iron oxide earth pigments varies with the composition of the particular segment of earth from which they come. The color of sienna earth pigments is derived from three constituents: the principal coloring ingredient, a secondary coloring ingredient and a base. The combination of these ingredients produces the particular color of the earth. The innumerable forms and variations in which these ingredients can combine result in the wide range of yellows, reds and browns. Principal coloring ingredient: Iron oxide hydroxide is the principal color producing ingredient in sienna earths. The properties of the particular iron oxide hydroxide present in the earth determines its color. The nature of the iron oxide found in the deposit, rather than its percentage, is critical to the resulting earth color. Most rock contains some iron oxide. Those bearing the least amounts are limestone, white clay and colorless kaolin. Those containing the highest amounts are the rocks from which metallic iron is extracted. Secondary coloring ingredients: Calcium, manganese oxide, carbonic materials, silica and limestone are some common modifiers that affect the specific color of natural sienna earth pigments. Manganese oxide, for example, enriches the brown in umbers. Base: Nearly all iron oxides have a alumina-silicate (clay) base. Clay is the weathered product of silicate rocks and is extremely varied in composition. As a result, it has numerous effects on the earth's color. Natural sienna earth is a yellow pigment with a more or less brownish red tinge in the mass tone and a more or less yellowish undertone. It differs from the yellow ocher by having a much deeper color, more than twice the tinting power, containing only two-fifths as much silica, only one-third as much alumina and from two and one-half to three times as much iron oxide hydroxide, and in addition to this from one to one and one-half per cent of manganese oxide, to the presence of which is due the difference in color. Natural sienna earth closely resembles yellow ocher by its composition. The content of iron oxide hydroxide in sienna varies from 40 to 70% while in ocher it may be less than 20%. A. H. Church reports the typical constituents of sienna based upon three analyses given by M. G. Hurst: Hygroscopic water 8.2 to 17.5%; combined water which includes traces of organic matter 9.0 to 12.4%; manganese dioxide 0.6 to 1.5%; iron oxide 45.8 to 59.7%; and silica 5.0 to 17.4% [The Chemistry of Paints and Painting, p. 230]. The differences in color between ocher and sienna earth pigments, is most likely due to the degree of hydration, or quantity of water bonded to its ferric oxide content. These pigments are basically composed of the minerals goethite and hematite associated with varying proportions of mineral impurities. Roasting natural sienna produces a very great change in its hue as well as in the depth of its color. 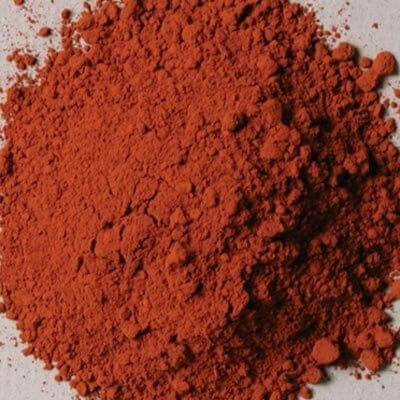 The iron oxide hydroxide becomes converted to iron oxide, this change being accompanied by a great increase in the translucency and depth of the color. 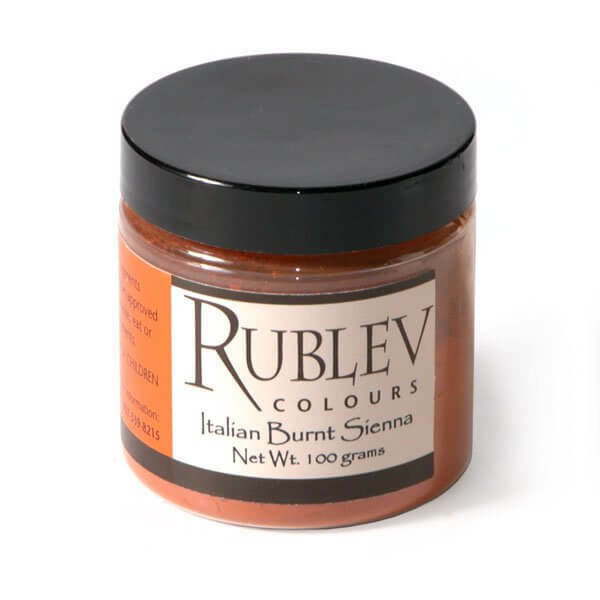 Our Italian burnt sienna is roasted in furnaces from natural sienna earths extracted from deposits in northern Italy. It is especially noted for its rich reddish brown color and transparency. Burnt sienna does not react with other pigments and is effectively used in fresco, oil, tempera and watercolors. It is considered to be permanent with medium tinting strength and excellent transparency. It does not react with solvents, and is indifferent to alkalis, but is partially soluble in acids. Burnt sienna requires a large proportion of oil to make it into a satisfactory oil-based paint. The oil absorption ratio is 45�55 parts by weight of oil to 100 parts by weight of linseed oil. If the measurement were grams, burnt sienna would require 45�55 grams (by weight) of linseed oil to grind 100 grams (by weight) of pigment to form a stiff paste. The pigment is considered non-toxic, but care should always be exercised when handling the dry powder pigment so as not to inhale the dust.